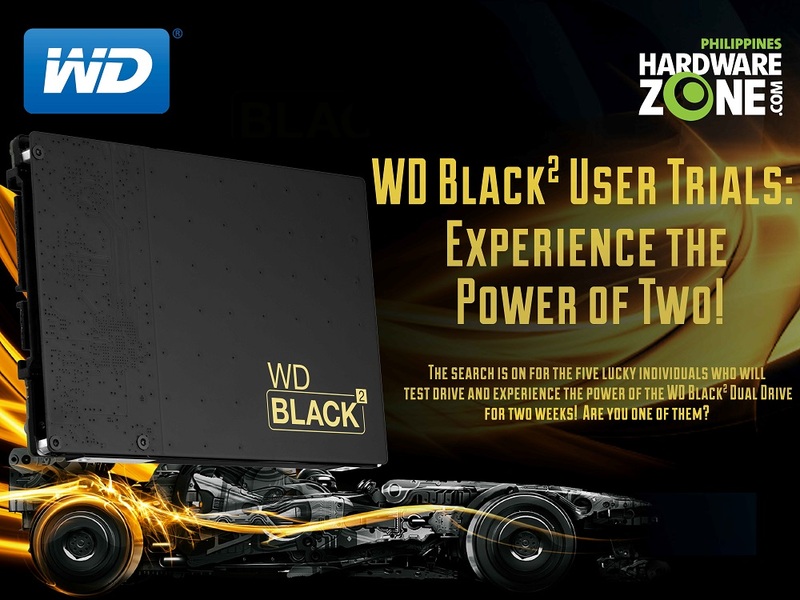 WD Black2 Dual Drive User Trials: Experience the Power of Two! is an online contest in which select individuals (preferably gamers) are chosen to test and use a WD Black2 unit for a period of two weeks. The participants are required to share their experiences while using it in real-world scenarios. The participant who will be able to impart the most relevant and sensible insights will win! 1. WD Black2 Dual Drive User Trials: Experience the Power of Two! is open to Filipino citizens (preferably gamers) who are currently residing in the Philippines and are of legal age. 2. Before a participant can join the selection process, he or she must join HardwareZone.com.ph’s Forums. 4. The entire campaign is divided into two sections: the selection process and the actual user trials. Participants must answer questions “Why do you want to join the WD Black2 User Trials?” and “What are the games that you play?” as part of the selection process. 5. HardwareZone.com.ph will select the top five answers. Those who provided the best answers will be eligible to be part of the user trials in next two weeks. 6. For the actual user trials, the five chosen individuals must share their experiences with the WD Black2 in two weeks. 7. Participants will share statements and photos regarding their experiences with the WD Black2 on the contest thread and HardwareZonePH’s Facebook fan page. Content may include photos of their setup, videos while running apps on HDDs, benchmark results, etc. 8. The user trials administrator will guide the participants by using a set of questions. 9. After two weeks, HardwareZone.com.ph will pick one winner. He or she will keep the test unit and take home brand new PC gaming hardware components from the WD. The remaining participants will keep their test units. 10. The entire user trials, including the selection process, is subject to SPH’s terms and conditions pertaining to contests and lucky draws. 11. The selection process will run from June 17 to July 2, 2014. The user trials will run from July 7 to July 17, 2014. Why do you want to join the WD Black2 User Trials? I would love to test out the world's first 2.5" dual-drive. I have been a long time user of Western Digital for my PC's storage needs. I also have been acquainted with mechanical drives since 10GB hard drives emerged and is also acquainted with SSDs as per personal use and in builds for customers. I am very much keen towards the performance of these two storage drive technologies, along side the performance variations from PATA to SATA and up until SATA III. I would be very glad to test this unique storage having the speed of a SSD but with the capacity of a mechanical drive. I am a computer enthusiast, a graduate of BS in Computer Engineering, and makes a part of my living through building computers. I am the president of a sole modding group here in Baguio City. What are the games that you play? I play various genres of games such as FPS, MOBA, and MMORPG. Some games tested and played are BattleField 3, DOTA 2, Flyff, NBA 2K9 up to NBA 2K14, Metro 2033, Just Cause 2, Mass Effect 2, Deus Ex Human Revolution, Dirt 3, etc. WD Black2 Dual Drive User Trials: Experience the Power of Two! 1. Why do you want to join the WD Black2 User Trials? Why would I want to join the trials? One word: awesomeness. Ever since I saw the drive announced on an international forum, I wondered how would it perform in real-world usage. And how much difference would it make, comparing it to various storage solutions that I have seen, tried and used. Such as comparing the performance if it would be put in place of the hard drive of my laptop. It would also be a great increase in knowledge base, especially since I make recommendations to people, either personal, or on forums, on various aspects in computing. It would be a rare experience having to see the marriage of a speedy Solid State Drive and a spacious Mechanical Hard Drive right into a single drive. 2. What are the games that you play? I play games which catch my interest, and which is capable of running on my hardware. More of my interest is in FPS and Driving Games. I play Call of Duty titles (CoD, United Offence, Modern Warfare, Modern Warefare 3), Need For Speed (Most Wanted, MW 2012, Carbon, Rivals), Fallout: New Vegas, and games which are available to be played, as long as they can run on the hardware. I want to experience what WD Black2 is blacking(bragging) about. I play Dota2 and SC2. What are the games that you (currently) play? Greetings Hardware Zone Philippines and WD Philippines! Here's my reply to the two questions asked including a brief introduction about myself. I'm a computer enthusiast and hardware reviewer for a US based tech site but I live here in the Philippines. We know outsourcing is very popular nowadays and let's just say even reviews are being outsourced now. Ever since I experienced the benefits of using an SSD boot drive, there's no going back. Well, that's what I thought before. For any enthusiast builder, it would seem that the appropriate build would be to have an SSD boot drive and a separate HDD storage drive. That was the only option until the hybrid drives like the WD Black2 came out. But since hybrid drives rather new, builders are seemingly reluctant to use or recommend hybrid drives based on my observation in forums and social media all over the world. I want to join the WD Black2 user trials address that very dilemma. I want to enlighten myself and others just what hybrid drives like the WD Black2 is about and what it can offer to gamers, builders and average computer users. I can already see certain benefits of using the WD Black2 such as using them in laptops. We know typical laptops only have one slot for a 2.5" drive and SSDs above 240GB is just too expensive for an average consumer here in the Philippines. There are a lot of things I wanted to answer by using a WD black2 drive because I myself haven't experienced a hybrid drive before. Basically I just want to know which is the cheaper option (SSD+HDD combo vs hybrid drive) as well as better in performance. I can explain that in both gaming and in benchmark tests such as AS SSD, CrystalDiskMark, ATTO, Anvil Storage, PC Mark 8 Pro, PC Mark vantage and others. Ultimately, I want to experience using a WD Black2 so that I can tell others what it offers. I can do a full review for the site if required. Currently playing Phantasy Star Online 2 and Dragon Nest SEA. Sometimes I play Battlefield 3 and 4 (but pings here in the Philippines are bad most of the time and I get kicked!). I also have Assassin's Creed 4: Black Flag (which I haven't finished because I lost all the saved sessions LOL) as well as Tom Clancy's Splinter Cell: Blacklist, Crysis 3, Mass Effect 3 and other games in my Origin and Steam library. Thank you for this rare opportunity, mabuhay HardwareZone PH and WD PH! Thank you for the responses guys! Keep them coming! After receiving my first SSD and made it my boot drive, everything was fast and snappy. SSD's are a big, if not, a huge upgrade for every gamer out there. Load times of games such as Battlefield 4 are cut down from 1 minute to 10 seconds! I can't even grab a glass of water after every round! I want to join the WD Black2 User Trials contest because I want to test out if the said SSD+HDD drive combo can compete with other single SSD's in the market even though it includes a hard drive. I currently own a Samsung 840 Evo 250GB SSD and I want to compare both drives and see which one will be a clear winner. I mostly FPS games but here's the complete list of stuffs that I mostly play. Steam: Payday 2, Left 4 Dead 2, Dota 2, Call of Duty Black Ops 2, Counter Strike: GO. Origin: Battlefield 4, Battlefield 3, Medal of Honor Warfighter, Mass Effect 3. Uplay: Watch_Dogs, Assassin's Creed 4: Black Flag, Assassin's Creed 3. Last edited by renz62; 27-06-2014 at 12:29 PM..
Hello everyone! Please be informed that some of you will be invited to WD's "technical dinner" where we're going to announce the five individuals who will be part of the user trials. We'll send PMs. Thank you! It always brings me enjoyment every time I try a new pc components. Hands on testing & bench marks. Gives me an advantage on reviewing & recommending what’s best for a pc system in the future. 1. Why do you want to join the WD Black2 User Trials? On my current HDD configuration I’m using a 60 GB SSD for boot drive and 3 x 500 GB HD for Games, Movies documents and virtual machines. 60 GB is a small amount of storage and can easily be used up by the operating system and other apps like adobe and office suite and my hard drive dedicated for movie is almost full at 420 GB. The WD Black² drive looks like a great solution for my problem it has a 120 GB SSD and 1 TB of dedicated storage so I would really appreciate it if I can be a Trial user for it. 2. What are the games that you play? Currently I play Dota 2, Starcraft 2 and world of tanks I also play Diablo 3 and heartstone occasionally. As an IT Professional, I would like to experience firsthand the dependability and durability as a storage solution. Being a Systems Engineer and Database Administrator, storage solutions is a must for me. Since Black2 is a combo drive ( SSD + SATA ) , I want to test and experience the usability of this new technology on my daily workload. Call of Duty series, StarCraft II series, Command and Conquer Series, DOTA, Battle Field series, NFS series are some of the games I play. I want to join the user trials because I need a faster hard drive. I mainly use my laptop for gaming, which only has a 750gb 7200rpm HDD. Was thinking of using an mSATA SSD for it but ended up being interested on WD Black2 which is just what I need. An SSD for all the stuff I need to load fast and a large hard drive for storing the other files which I normally need. And it's all in a 2.5 inch form factor! Fits perfectly for all my needs which are gaming and editing multimedia. My favorites are Guild Wars 2, Battlefield 4, DotA 2, Diablo 3, Phantasy Star Online 2. Those are what I currently play.